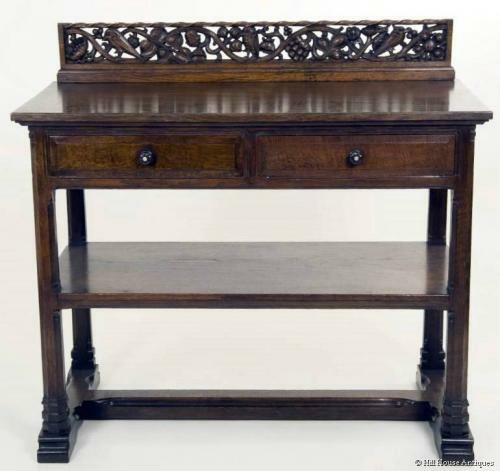 Important & rare oak hall or side table designed by the important Scottish architect-designer, Sir Robert Lorimer, complete with it`s charming & beautifully carved back upstand by the Clow Brothers; c1910. The carving of the upstand especially, has some very close similarities to his design work at the Thistle Chapel, St Giles` Cathedral, Edinburgh, amongst other commissions by him. Approx 45" wide, 36" table top height and 42.75" overall height, 20.75" deep.